Film Review With remakes and cinematic universes being all the rage in Hollywood these days, the King Kong franchise seems like fertile ground to attempt to rekindle something that could spurn a series of films. With the moderate success of 2014’s Godzilla film, this year’s Kong: Skull Island is set within the same universe, however it takes place a couple decades earlier in 1973. Warner Bros has every intention to unite the two monster franchises in a mono a mono battle called Godzilla Versus Kong in 2020. But while Gareth Edwards’ Godzilla film took itself quite seriously, Jordan Vogt-Roberts’ Kong: Skull Island is an action romp that sets out to recapture that good ol’ monster movie feel — and succeeds. When Samuel L. Jackson’s character, Packard, goes so far as to quote his famous “Hold on to your butts” line from Jurassic Park (a modern classic “monster movie” featuring Jackson), you know you’re in for a wild ride. And Vogt-Roberts gives viewers just that. The film’s tone takes itself relatively seriously, but there’s a sense of fun thrown into the mix here as well — from the frequent use of 1970’s rock favorites to drive the action, to the soldiers joking around with each other and the action sequences bringing frequent deaths and mass destruction. It’s the kind of fun action, “creature feature” that used to be popular in the 80’s and 90’s (and before), with a twist of today’s humor and heart. The film is a bit frenetic at times, though. When you feel like it’s going to develop a few deeper relationships — whether between Brie Larson’s photographer character Mason Weaver with Kong himself, or with her and Tom Hiddleston’s heroic James Conrad — we only get shallow connections. It’s just barely enough to give the film a little substance, but ultimately, Vogt-Roberts and his team kind of waste a chance to give a fully satisfying action adventure with some extra meat. But even though there’s a sense that it falls a hair short of being something greater, it actually still delivers. I caught the film on the big screen when it was in theaters and really enjoyed it, but I found myself enjoying the second viewing a lot more. It almost does the balancing act that Brendan Fraser’s The Mummy did in 1999 between action, adventure and comedy. There’s plenty of violence in this film too, with some gruesome people and creature deaths. John C. Reilly’s marooned soldier, Hank Marlow, provides some truly over-the-top comic relief, but it helps break up the tension caused by just how awful this environment is for Skull Island’s new hapless visitors. It can be a little jarring at times — even feeling a bit out of place — but it still works surprisingly well. The second viewing was my first seeing the film in 3D on Blu-Ray, and it’s definitely worth it. While this kind of 3D isn’t quite as immersive as something you might see at a theme park attraction, it still gives an added depth and usually is some fun additional eye candy. If you like 3D and have 3D capabilities at home, Kong: Skull Island is a great option. The content is firmly within the PG-13 rating. As I touched on briefly, there’s quite a bit of action violence. It’s in spurts, but usually the film goes all-out when it does let loose. The opening scene shows Hank and a Japanese soldier crash-landing on Skull Island during WWII, and the two fight it out, with Hank stopping the enemy’s sword by grasping it with his bare hands (Yeah, ouch!). When the helicopters arrive on Skull Island and grab Kong’s attention, there’s a thrilling but intense sequence where Kong proceeds to smash one vehicle after another and even crush the survivors on the ground (or eat one in mid-air). The other survivors have varying amounts of blood on their faces and heads from that point on throughout the rest of the film. One character gets a mouthful of a huge bamboo pole that turns out to be a gigantic insect’s leg (it’s pretty gross). Another character is yanked off a boat by monstrous birds who tug at him in the air, silhouetted against the sun — and we then see a bird slice off his arm as he screams. Kong also fights other creatures, including a huge octopus, which he rips tentacles off of, and “Skull Crawlers,” one of which he rips the tongue and guts out of. Other content includes frequent profanity, including a use of the “F” word by Reilly and an incomplete “motherfu…” from Jackson. While by no means a masterpiece, Kong: Skull Island is a visually impressive, fun action/adventure monster movie. 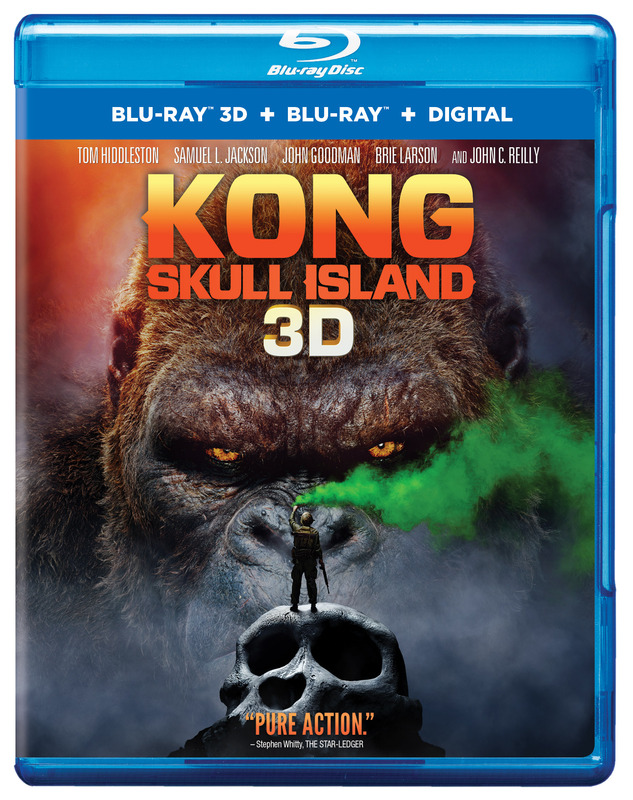 I would have preferred Vogt-Roberts refrain from the frequent profanity use or tone down some of the violence, but as-is, Skull Island is a very entertaining flick that fans of the beast and the genre should thoroughly enjoy. On Location: Vietnam (5:38) reveals that this film is the largest production to have ever filmed in Vietnam, and how most people don’t realize how beautiful the country really is. Tom Hiddleston: The Intrepid Traveler (6:53) – This is a little featurette that’s mostly a collection of candid footage of Tom Hiddleston on various locations during the film’s production — from Hawaii, where he goes up in a real helicopter with Brie, to a sound stage in Australia where they filmed the natives’ temple, to on location in Vietnam for the boat scenes. Through the Lens: Brie Larson’s Photography (2:19) – The director insisted–with Brie’s approval–to make sure she always had real film in her camera at all times during production. Here we see a series of photos she took on set with Jordan Vogt-Roberts’ talking about it in narration over the photos. Monarch 2.0 (Companion Archive) (7:58) – This is a series of Houston Brooks’ scientific tape recordings of animals, monsters, Kong, the island natives, etc, to serve as mock secret case files Brooks made during his expeditions. Commentary – You have the option to listen to a feature-length commentary from the film’s director, Jordan Vogt-Roberts. Deleted Scenes (3:45) – There are just a couple deleted scenes that are all lumped together in one montage. The first shows Packard reuniting with the soldiers in the hangar, where we realize they’ve all served with him for quite some time. While you kind of get that from watching the movie, I like this little interaction they have (1 “a–h*les,” 1 “h*ll”). The next scene is more footage from the night before they leave, where one quips that “computers are so small now, they can fit on a helicopter” (Ha!). We then see Packard meeting Conrad for the first time and Conrad asking Randa why the helicopters are outfitted with guns. Finally, after the helicopter wrecks, Packard finds a bloody soldier passed out on the ground and wakes him up, and then there’s a short additional moment of the soldiers walking through jungle (1 “S” word). Blood/Gore: Two men who crash-land on an island chase each other through the jungle and have a lot of bloody scrapes on their face and head. As they fight, one pulls a sword on the other and the victim grabs the blade to keep it from stabbing him and he screams as it slices his hands (with some blood on the sword); Packard has a bloody nose and some blood on the side of his head; A young soldier has scratches on his face; Chapman has blood on his nose and mouth; Mills has blood on his nose and arm; We see another soldier with a bloody nose and blood on his head and face; The leg of a gigantic spider goes into a man’s mouth from above (it’s huge and gross). The body falls when the bug pulls the leg out; As the soldiers slice off the legs of a gigantic spider, we see blood squirting. We see a lot more as they shoot the body. We then see lots of gooey mess drip down on the men below; Kong inspects blood on his arm and scrapes on his hand; A gigantic octopus attacks Kong. He stomps on it and rips off some of the tentacles. He then sits down in the water for a moment and eats it; A Skull Crawler has blood on its mouth from eating a large animal; Packard shoots a monstrous bird’s head and it explodes with a splatter of blue blood; We see blood dried on large spikes sticking out of a wall protecting the natives; A cow-like creature has some blood on it; We see a bloody hand print of Kong’s on the side of a mountain; A Skull Crawler lunges at a character and we see a splatter of blood land on a walkee talkee; Some large birds carry a character off a boat and into the air. We see a silhouette of them against the sun as another bird swoops buy, slicing off their arm, with some blood spraying; A Skull Crawler barfs up a human skull with some partially digested flesh on it; We see a close-up of a deep gash in a Skull Crawler’s leg as it is cut with a sword; Conrad takes the sword and slices up a lot of the monster-like birds, with blue blood splattering with each one. One slow-motion shot shows him slicing one in half right at the screen; The big Skull Crawler wraps its tongue around Kong’s arm and Kong pulls it out of the monster’s body, pulling some of its guts with it. Violence: Two men who crash-land on an island chase each other through the jungle trying to kill one another. As they fight, one pulls a sword on the other and the victim grabs the blade to keep it from stabbing him and he screams as it slices his hands. Kong then interrupts them by crashing his huge hands on the cliff around them; We see real footage of war and explosions during the opening credits; Conrad beats up a couple guys in a bar with a pool stick and by hitting a ball back at one of the guy’s faces; A tree is seen flying through the air and going through the windshield of a helicopter. Kong smacks another out of the sky and, while holding onto one, causes a soldier to fall out into his mouth; They shoot at Kong. He punches down a helicopter. Kong steps on a crashed helicopter killing two men. Two more helicopters crash into each other and crash to the ground. Kong steps on another guy. He then throws a guy into a helicopter window and the body slides up the windshield into blades (the impact is not shown). Kong throws down a helicopter and smashes more. We see and hear soldiers running and screaming; Most of the crash victims are beat up and bloody; Chapman looks back and sees dead men inside his helicopter; The leg of a gigantic spider goes into a man’s mouth from above (it’s huge). The body falls when the bug pulls the leg out; Natives of the island with spears surround the main characters; A gigantic octopus attacks Kong. He stomps on it and rips off some of the tentacles. He then sits down in the water for a moment and eats it; We see Kong fighting some Skull Crawlers; Packard shoots a monstrous bird’s head and it explodes with a splatter of blue blood; We see a downed helicopter trapping a large cow-like animal underneath; Chapman shoots at a giant stick bug; A Skull Crawler lunges at a character and we see a splatter of blood land on a walkee talkee; We see a big grave site with lots of bones – some human, some apparently Kong’s family; Some large birds carry a character off a boat and into the air. We see a silhouette of them against the sun as another bird swoops buy, slicing off their arm, with some blood spraying; A Skull Crawler barfs up a human skull with some partially digested flesh on it; We see a close-up of a deep gash in a Skull Crawler’s leg as it is cut with a sword; A Skull Crawler uses its tongue to grab a soldier and eat them; A soldier uses a flame thrower on the Skull Crawlers and it kills him by causing his thrower to explode; They shoot at some of the monstrous birds. Conrad takes the sword and slices up a lot of the birds; A Skull Crawler catches on fire and we see it burning; Packard and his crew use napalm and cause some explosions. Packard ignites the water, catching Kong on fire; Kong splashes napalm on a man and smashes another man; Kong smashes his hand down on a character, killing them; A character carrying grenades is swatted by a Skull Crawler’s tail. He hits a rock wall and explodes; Kong smashes a big Skull Crawler with a rock and they fight. The Brooks uses a large machine gun against the monster. Kong hits it with a ship’s propeller and cuts it in the process; Mason falls into the water and nearly drowns; The big Skull Crawler wraps its tongue around Kong’s arm and Kong pulls it out of the monster’s body, pulling some of its guts with it.